The City of Brotherly Love invites you to come experience Liberty First. Philadelphia welcomes you with open arms to “America’s Most Historic Square Mile.” In this mile you can visit the Liberty Bell, the new national Constitution Center, Ben Franklin’s Office and Independence Hall, just a block from the beautiful Convention Center attached to your hotel at the Philadelphia Marriott Downtown. 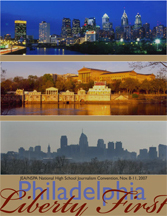 See history come alive and learn how to record history at the 2007 Fall National High School Journalism Convention as student journalists from across the country pack the new Convention Center. Come to discover journalism in the city where freedom was born. Home of the Constitution, the signing of the Declaration of Independence and the first home to the nation’s capital, Philadelphia is the fifth largest city in the United States. Several blocks away from the convention center you will find the national African American Museum, the largest museum of African American culture, which boasts four galleries of exhibitions and presentations. In the Convention Center District, visitors can tantalize their palettes on foods from China, Indonesia, Thailand and Vietnam. If you are looking for American cuisine, the Hard Rock Café, The Melting Pot Restaurant and Delilah’s Southern Cuisine can tempt your taste buds.